At the beginning of 2014 I published my list of minimalist goals for the year. One of these was to redesign our small lawned back garden into a low maintenance courtyard garden. We moved to this house in June 2012 and have done nothing to the garden. Last year we hoped to remove our small lawn but were unsure exactly how to do it. Needless to say, the project never got off the ground (please pardon the pun). This year I was determined to have a clear plan and get the project started (and finished) by late spring. The recent warm spell has spurred us on. So after some research and discussion we have been playing with some new designs. Here's our current design (hubs' fantastic handiwork - thank you). You'll see from the photo below of our garden last summer that we're not planning to change the basic structure of the garden so the tree, fence, deck, paving and very small shed.will remain in place. Our budget is small so as well as designing it ourselves we will also be doing all the labour ourselves. Our money will go on membrane, gravel, edging (recycled wood possibly), pebbles, deck stain, paint (for the fence and shed), improving the soil and buying new plants. If we can we will recycle materials and barter for plants from family and friends. 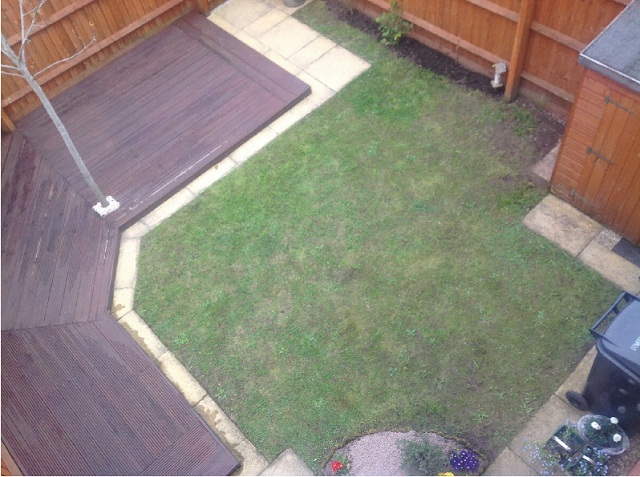 The main aims of this garden redesign are to make the garden lower maintenance and more attractive. Although I love plants and gardening I am now happy not to own every plant ever created. I do miss my large garden from our previous house but not the hours of work that it needed to stay looking presentable. 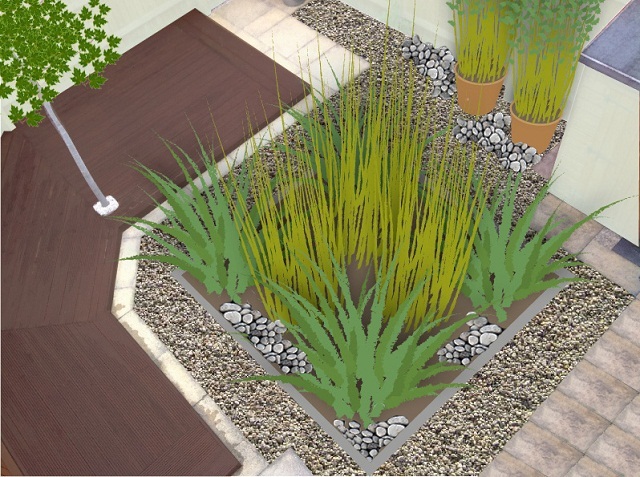 The planting look we're going for in our back garden is a strong design with structural plants that will have impact all year round. Think grasses, box, phormiums, lavender and bamboo. Think more time relaxing in, and less time working in, the garden. The front of our house has a much sunnier aspect so here I will indulge my inner rustic with a few seasonal pots, possibly some home grown veg and a little bench. I think that will give me the perfect balance of being able to relax in but also being able to potter in the garden. So, what do you think? Do you have any suggestions? Plants? Colours for the shed and fence? I'd love to hear. Replaced my lawn with gravel a few years ago and when I feel a need for more plant areas we just scrape a bit back, pop a few compost bags down on the membrane with one side open, plant up and arrange gravel up to them. This way we just pick them up and rake the gravel back afterwards when the flowers are done! Looks wonderful. I've done some low maintenance planting in the front garden, with plants through membrane and gravel. I'm looking forward to seeing your garden when it's done. I think the design looks great, it needs something fairly simple/straightforward for the size of the plot. If you wanted to add a bit of colour you could just add a couple of pots that you fill with seasonal flowers. Your husband's design looks fabulous Claire and has a wonderfully serene appeal. Reducing the amount of work needed to maintain the area will certainly allow you to enjoy it more! Wainwright & Wright Co's comment to add a pot of seasonal flowers is a good idea too. I am sorry but I find it austere and depressing. Where does wildlife get a look in? Hello C. Jones, I agree with you. No birds, no hedgehogs, no frogs, no wildlife whatsoever and nothing to attract them. She's obviously one of those people who will lament the extinction of species of wildlife and wonder how that happened! I love the minimalist approach to gardening. My space on the outside has no clutter, so my mind is free to contemplate higher things. The Japanese Zen garden takes nothing away from your own imaginative powers to create harmony within yourself. When it comes to meditating there is nothing like creating a place with virtually nothing to distract you. For me, less is definitely more! The sound pollution, the heavy cold and extreme heat outside is not good for us.So I personally prefer and too suggest people to have double glazing uk for turn window for their comfortable and healthy living. Garden configuration can be personally cleaned to the style of your home as in case of the fantastic french chateaux where the geometric examples of the garden copy the geometric development of the house or it can have no association with your home by any stretch of the imagination.